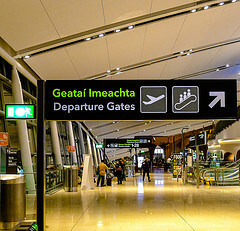 More than 200 people a day left Ireland in 2012. That's a level of emigration that hasn’t been seen in the nation since the Great Hunger in the mid-19th century. A staggering 87,000 people reportedly left the country in the year to April 2012. You probably know all about it. If you're a recent arrival to these shores you'll know better than anyone about the personal cost of the Irish banking crisis and the way it's still decimating the country’s economy and future, ripping apart families, then scattering them around the globe. Some 16,000 went to Britain last year. Around 21,753 fled to Australia in the hope of a better life, while 17,143 Irish people and their families won temporary work permits in the U.S. and Canada - the latter more popular now for its booming economy and better immigration prospects. It's as though an asteroid hit Ireland and sent tens of thousands of us into the upper atmosphere. I don't expect that most who found themselves arriving on foreign shores in the past 12 months think of their move as a positive development. More likely it felt like desperation. We've been through this kind of severance before. The Great Hunger represents a Year Zero in Irish history. All of our experience as an exploited colony moves toward and away from that unspeakable disaster, making it the fulcrum on which our fate was written. There are other transformative events in our history of course, but none with its reach and scope. The Great Hunger drew a dividing line under Irish history. More than the Flight of the Earls, more than the Plantation of Ulster even, the Famine broke the living link that connected us to our ancient past. It was the nuclear strike that decimated the Irish people and the Irish language. For over 100 years those who lived through it and those who followed afterward flailed and faltered blindly, like blast victims in the aftermath of a bomb. Unable to countenance the disaster that befell them, a huge silence fell that ultimately corrupted our civic life and institutions. It can be hard to see a crisis when you're standing near its center. But the collapse of the Celtic Tiger has been much more than just another economic challenge for a nation that has known many. We're actually looking at something much more consequential than a temporary financial difficulty. We're looking at a generational severance that has almost no chance of repairing itself within the scope of one lifetime. First came the Anglo Saxons, then came the church, then came the austerity and the International Monetary Fund. The horse changes riders, Yeats wrote, but the lash goes on. It's worth remembering that you didn't invite any of these institutions to Ireland's shores, but your fate has been sealed by them before you were given a chance to have a say in the matter. The only vote you really have is where to direct your feet. Or, at least, it has been until now. You'll remember how Ireland's budget ended up being inspected in Berlin before it was announced in Dublin last year? That's the kind of thing that happens when you're forced to accept a $113 billion bailout package from the EU and the IMF as your Celtic Tiger turns into one of Europe’s teetering basket cases. Recall that in the past when you left Ireland it took its leave of you too. We actually even called it an American Wake. Your family, neighbors and friends stopped by your home to mourn your passing, even though you were still standing in front of them. It was a kind of death. It was a ghastly tradition, and one born of desperation, not strength. In the past successive Irish governments have approached the global Irish diaspora like an ATM. You were hit up for a handout, then instantly forgotten about. Irish governments are still doing that in 2013. They don't really care if it causes you some resentment. Once their Aer Lingus flight touches down in Dublin with your checks in hand, what does it matter what you felt about it? This can't be allowed to continue. We have to insist now that if the Irish government wants our cash we have to become real participants in the political life of the nation. After all, an emigrant can often untangle the issues that beset a nation more clearly than the people who are actually standing on its soil. Think of Senator George Mitchell. Think of James Joyce. Our great writers and peace makers could do it, so why wouldn't it be true in the life of the nation now? It is time for Ireland to harness the power and global influence of its diaspora, but this time the conversation will have to be two ways. If you were fortunate enough to be born there you ought to be able to vote there, regardless of where you find yourself now through economic necessity or opportunity. You may be our best hope.